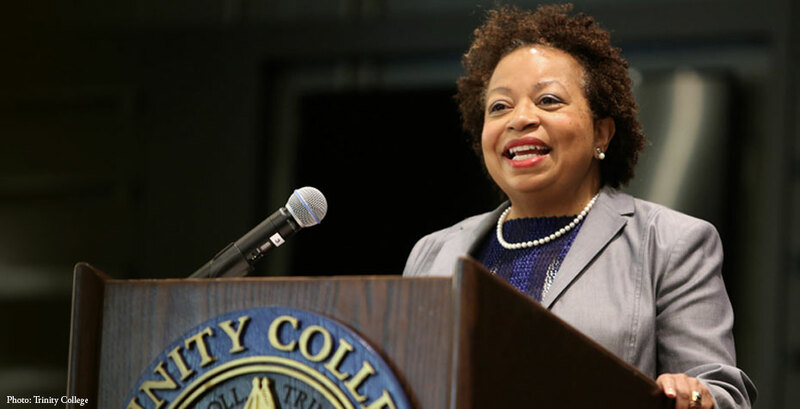 On July 1, Joanne Berger-Sweeney '79 began her tenure as president of Trinity College in Hartford, Conn. Berger-Sweeney is the first woman and the first African American to lead the liberal arts college. Berger-Sweeney is a distinguished neuroscientist, professor, and administrator. After earning degrees from Wellesley, the University of California Berkeley, the Johns Hopkins School of Public Health, and the National Institute of Health in Paris, she joined the Wellesley faculty in 1991. She served as an assistant professor in the Department of Biological Sciences, and later held the position of Allene Lummis Russell Professor in Neuroscience. Her teaching and research career at Wellesley spanned 13 years prior to her being named associate dean in 2004. As associate dean, she oversaw 20 academic departments and programs in addition to her teaching and research. She left Wellesley to become the dean of the School of Arts and Sciences at Tufts University, where she led a number of innovative and interdisciplinary initiatives on campus. Berger-Sweeney's election as president of Trinity College received extensive coverage, including in the Hartford Courant, the Chronicle of Higher Education, by the Tufts Daily, and on Wellesley's website.